The CCR, entity in charge of the re-insurance cover of natural catastrophes in France, has carried out a modelling exercise, in association with Météo France, of the evolution until 2050 of the main climatic risks already covered by the French Cat Nat system. 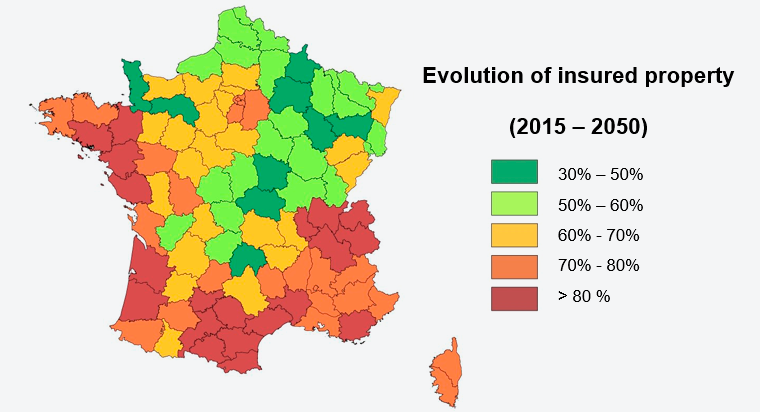 The study results in interesting conclusions about the behaviour, in terms of hazard and vulnerability, of the expected evolution of insured losses and reflects on the future capacity of the current natural catastrophe insurance system in France. The Caisse Centrale de Réassurance [Central Reinsurance Fund (French abbreviation: CCR)] is a reinsurance company whose mandate is to design, put in practice, and manage efficient instruments that respond to the need for coverage of catastrophic risk and thereby serve its clients and the general welfare. 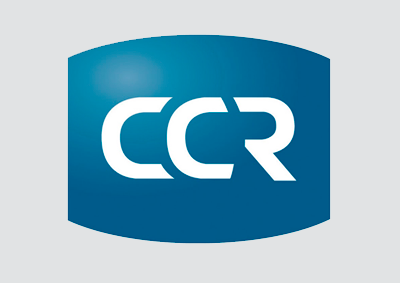 In particular, the CCR operates in the field of reinsurance for natural disaster risk. For a number of years now the CCR has been emphasizing evaluation of the impact of natural disaster hazards on Government services and its clients, especially by modelling. Dissemination of natural disaster insurance for relatively common risks, for instance, based on the threshold of a 10-year return period for flooding. The Act of 13 July 1982 did not enumerate the perils covered, nor did it specify the hazards excluded. Article 1 of the Act merely describes what is to be understood as the effects of a natural disaster, namely: “direct uninsurable material damage whose immediate cause is the abnormal intensity of a natural event”. The above list is not limiting. 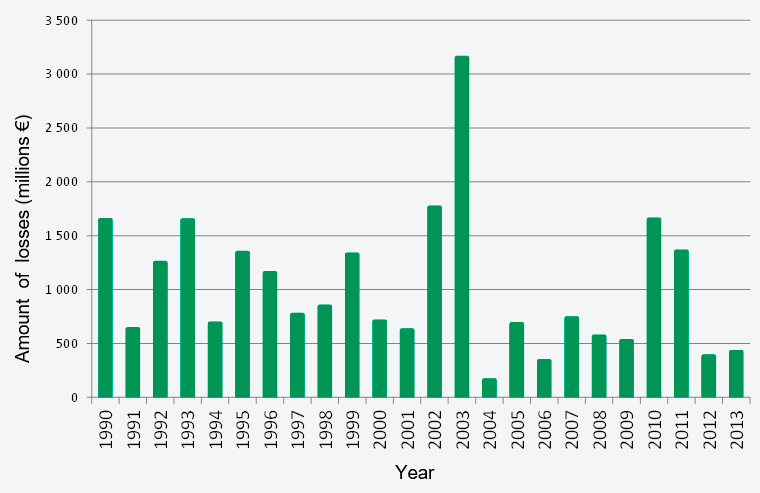 Figure 1 shows the trend in the amount of indemnities paid under the Cat Nat system for the period 1990-2013 (updated insured property values). Figure 1. Estimated total indemnities updated to 2014 euros. Updating the cost of claims enables different years to be compared by removing the property value appreciation effect. This reveals peaks coinciding with extreme events (e.g., the unusual drought and the Rhône River flood in 2003), but at present no appreciable upward (or downward) trend is discernible. However, will this continue to be the case in the future? The CCR has joined with Météo France (the French national weather service) to carry out this study on the impact of climate change on natural disaster insurance. 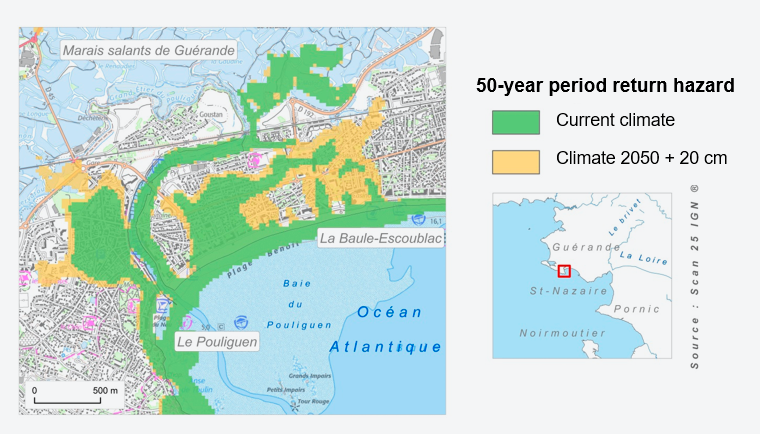 What trends in the frequency and severity of weather events can be anticipated in metropolitan France towards by year 2050? What trends in exposure are to be expected for the insurance market? Will the concentration of insured covers in risk areas continue and thus intensify the impact of weather events? Will the Cat Nat system be able to keep pace with these changes in the near term? Météo France and the National Centre for Meteorological Research (French abbreviation: CNRM) for climate, flooding, drought, and storm modelling. 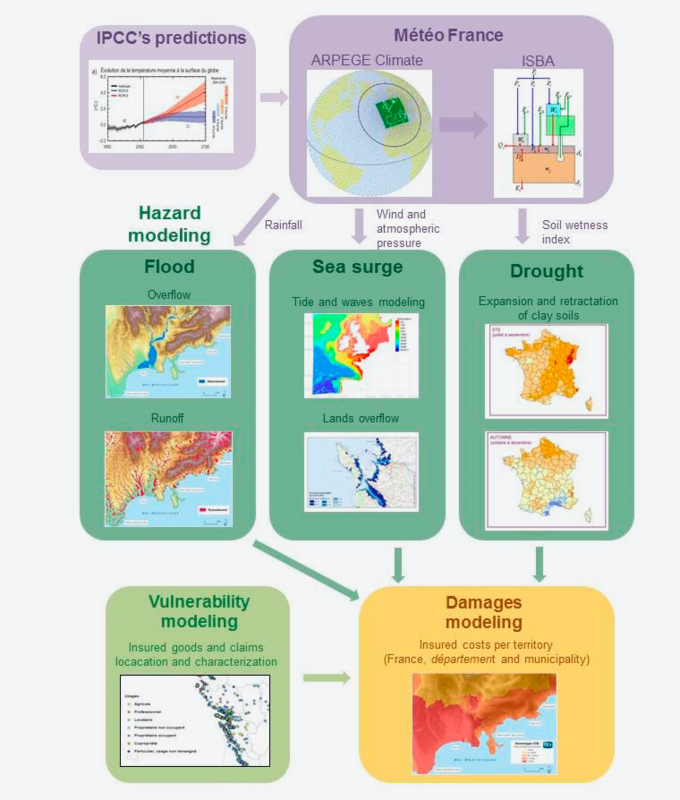 The French Geological Survey (French abbreviation: BRGM) for drought and coastal flooding modelling. The National Research Institute of Science and Technology for Environment and Agriculture (French abbreviation: IRSTEA) for flooding modelling. To assess the costs of natural events a short time after they have taken place for the purpose of estimating the financial impact on insurers, the CCR, and ultimately, the Government of France. To uniformly assess the global exposure of private or business property to potential natural events in metropolitan France and in overseas France covered by the system. A catalogue of events based on climatic conditions forecast for 2050 according to the IPCC RCP4.5 scenario (1). In the framework of IPCC-related activities, Météo France has applied its global ARPEGE CLIMAT model to each of the projected trends in greenhouse gas concentrations considered to generate simulations for the entire planet up to 2100. To meet the CCR's needs, Météo France has configured ARPEGE CLIMAT so as to be able to fine-tune the calculations for a region of interest, including 31 vertical levels for two simulations over 200 years with an hourly temporal resolution and a 20-km spatial resolution for Europe according to a constant current climate scenario (around the year 2000) and a future climate scenario (around the year 2050). Simulation of losses produced by these catalogues of events on a portfolio comprising the set of all insured property in the French marketplace as a whole has yielded mean annual loss breakdowns based on current climate conditions and climate conditions in 2050. Figure 2. Modelling chain used to study the impact of climate change. The simulation of natural events around 2050 has to take into account projections concerning changes in the insured property. The value of insured property will in large measure depend on their geographical distribution. How to estimate this geographical distribution? For our projection for around 2050 (Figure 3), we have taken as a basis the scenarios forecast by the National Institute of Statistics and Economic Studies (French abbreviation: INSEE), which analyse demographic trends by department, along with our own historical data series for property insurance coverage by property type (individuals, businesses). Figure 3. Map of changes in insured property coverage by department, 2015 to 2050. Modelling took into account surface runoff and watercourse overflow. The map in Figure 4 depicts trends in exposure to runoff at the present time and around 2050. Figure 4. Variation in the frequency of flooding risk modelled by the CCR in 2015 and in 2050. In terms of damage, the effect of flooding hazard alone accounts for a 20% increase in average annual losses. The model takes into account the effects of the RCP 4.5 scenario and the global increase in precipitation according to simulations run by Météo France. Basically, the impact of the climatic scenario is greatest in small drainage basins as a consequence of surface runoff. The effect of flooding on flat areas of plain is in fact less substantial. In southern France, increased flooding risk will go hand in hand with increased vulnerability, which will entail a rise in exposure considerably higher than the national average. Three aspects of exposure of the Atlantic coast have been analysed with a view to 2050: the effect of trends in climate change, the impact of rising sea levels, and lastly vulnerability trends. The results for climate change do not yield any clear trend toward greater severity or higher frequency of coastal flooding in 2050. It appears that, absent changes in vulnerability, mean annual losses would hold steady between 2015 and 2050. At the same time, costs would be higher in the most extreme years (return period greater than 30 years). The repercussions ensuing from higher sea levels, however, are much more apparent. Accordingly, a significant increase in damage resulting from a rise in sea level of 20 cm (corresponding to the IPCC RCP 4.5 scenario) is forecast in terms of both mean values and a 30-year return period. This finding is particularly clear in the most low-lying coastal areas. As shown in Figure 5, a 20 cm rise in sea level would entail significant expansion of areas vulnerable to flooding over the same return period. However, changes in vulnerability exert the most important effect in terms of estimated costs in 2050. Two factors are responsible for driving this increase: the rise in the value of insured property and the rise in population levels. A slight general tendency towards drier soils (2) is observable in the eastern half of the territory in winter. In spring, dryness of the ground would be higher only in the southeastern sector, with distinctly higher ground moisture levels predicted in the western half of France. In summer France can be observed to split in two, with greater soil moisture levels in the northern half and drier soils in the southern half. Lastly, no appreciable changes in soil moisture are observed in autumn. Annual costs charged to the Cat Nat system could increase by an average of around 114% in metropolitan France by around 2050. This major increase is basically ascribable to increased vulnerability and, in particular, to the estimated increase in the insured values of buildings, practically the only property subject to this hazard. The higher risk due to climate change would only result in a 3.1% increase in mean annual losses within metropolitan France as a whole. Coverage of numerous climate risks is one of the specific features of the Cat Nat system, for instance, coverage of flooding caused by overflow, runoff, rising groundwater levels, coastal flooding, storms, drought, etc. Most existing models of natural disasters have been developed taking into account hazards by territory. To obtain results for several risks together at the same time, considering each separately and then randomly totalling up annual losses is the generally accepted approach. The new approach presented here has been to model the impact of all three risks analysed on the basis of a single set of climate data yielded by the Météo France model. This means that event occurrence arises from climatic conditions common to all the risks. 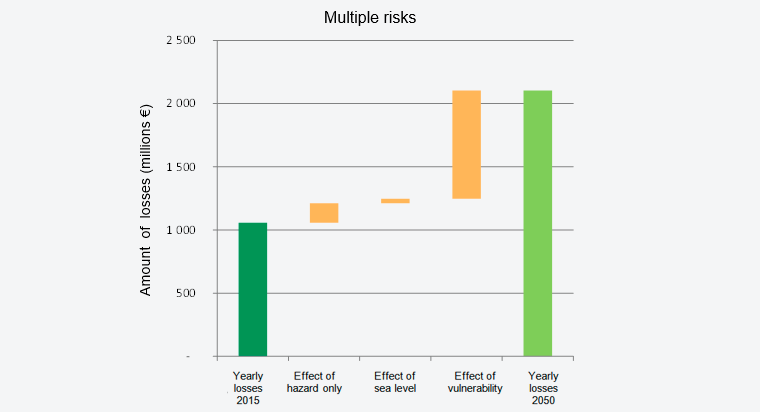 The graph set out in Figure 6 depicts the accumulated effect of hazard, rising sea levels, and vulnerability for the three risks modelled. The main factor increasing mean annual losses for the three climate risks is increased vulnerability. As a whole, the Cat Nat claim rate in metropolitan France attributable to the main weather phenomena each year should double between now and 2050. The increase is due primarily to changes in insured property values and the geographical distribution of those values (some 80% of the anticipated increase). The study results reveal that climate change can also be expected to have an impact on claim rates and that this would account for around 20% of the increase forecast for 2050. Figure 6. Changes in cumulative mean annual losses for the three risks modelled on the basis of the RCP 4.5 scenario. The work carried out by the CCR in association with Météo France over the course of 2015 to assess the financial impact of climate change on the Cat Nat system on the basis of the IPCC RCP 4.5 scenario has succeeded in disclosing some initial trends. Flooding due to overflow and surface water flow: a rise of 20%, mainly as a consequence of an increase in convective phenomena originating in the Mediterranean Sea. Coastal flooding: an increase of over 60%, mainly related to rising sea levels (more than 20 cm by around 2050 according to the scenario considered by the IPCC). Drought: damage will hold constant for the nation as a whole, but the results of the study performed at finer scale are indicative of large regional disparities. The study of coastal flooding has for the time being been restricted to the Atlantic coast. Consequently, modelling needs to be expanded to include the Mediterranean coastal area. From a methodological standpoint, this project has made it possible, for the first time, to couple a large-scale global climate model with several models of repercussions operating at an extremely fine spatial resolution. By the same token, the choice of scenario was a key aspect. On the advice of Météo France, we have opted for an intermediate scenario (RCP 4.5) whose starting point is an optimistic view of the positive effect of the climate negotiations currently under way. The model makes no allowance for developments in preventive measures or implementation of risk prevention plans at a future date. Thus, this study has regarded protection works as constant. What does this study teach us regarding the Cat Nat system? The results reveal a likely substantial increase in the cost of claims related to weather events, due either to higher insured values or to increased hazard brought about by climate change. Addressing the issue of the Cat Nat system's ability to adjust to these additional costs is thus appropriate. Even though the losses indemnified as a consequence of climate risk will climb in the future, the system's footing will not be fundamentally unbalanced, because premiums will change in consonance with the trend in insured values, which accounts for most of the expected increase in claims. This system of indemnification for natural disasters, unique in its class, has proven itself to be effective to date. For over 30 years it has made it possible to pay indemnities for all the events that have taken place, including years heavily affected by natural disasters, for instance, 1999, 2003 and 2010. Years like those, with exceptionally high claims, attest to the robustness of the system and demonstrate that it will be able to adjust to climate change. It may be necessary to make some adjustments to the rates, but at all events these can be expected to be relatively moderate as a result of preventive actions of all kinds and cooperation by all the operators. The Caisse Centrale de Réassurance [Central Reinsurance Fund (French abbreviation: CCR)] is a reinsurance company whose mandate is to design, put in practice, and manage efficient instruments that respond to the need for coverage of catastrophic risk and thereby serve its clients and the general welfare.